This morning I set out for my first solo long run in what seems like ages. I've been quite spoiled to have an outstanding group of women to do long runs with for the past year or so. While schedules sometimes get crazy, I've usually managed to have at least one running buddy. Due to the LL Bean 10K taking place this Wedensday and a scheduled 15 miler long run for the weekend, I had a conflict of interest going on. I need to stay on track with marathon training (especially since I kind of threw the plan out last week prepping for the half marathon) yet I ant to do well on Wednesday. Some people can bounce back from a long run and perform well, but not me. Part of me wanted to keep my long run on Sunday just so I could have a running buddy or two, but a bigger part of me was positive that my body wouldn't be recovered for the 10k. It was a very humid but cool 58F when I set out this morning. It was absolutely perfect running weather. 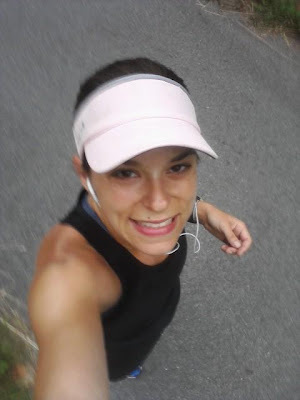 I chose to go to my fave route - the rail trail - because it's paved, I know the route like the back of my hand, and I knew I'd see some familiar faces to at least break up the run and I could at least say hi. I know the rail trail is only 13 miles and I was doing 15, so I settled for adding on a little out and back on the trail at the end. Boring - yes, but safe and predictable. This pic if from about mile 9. I had gotten a text from Stacy (about beach plans - SUPER important, which meant I HAD to stop) - which meant perfect time for a water/fuel break. Just after this picture, the clouds broke loose and I had a nice, cool rain for the remaining 6 miles. The rain was quite welcome and felt glorious. I finished this run and I'm quite impressed with myself. It wasn't my favorite run but it wasn't as bad as I thought it would be. Of course, after the short little rain session, the sky brightened up and we had a perfect beach day waiting for us. It's really a tough life to have to recover by the water with incredible friends while the kids play in the water. and this one didn't want to leave, of course! Sounds like a good run. I already miss the Rail Trail and the beach! Next week is looking like prime beach weather and my schedule isn't as crazy after Wed. Can't wait! Podcasts and audiobooks have really helped get me through my solo long runs. A little rain would feel so good here! Which podcasts do you listen to??? I rain on the rail trail purposely (due to the safety) so I could listen to my iPod. Music helped but a podcast or audio book might help too. Congrats!!! Long runs like that by yourself can be difficult but you rocked it!!! Thanks! I need to focus on trying to do a few more by myself since I am going to run MDI without any of the girls. I know there will be other people there - but that's not the same! You looked great at mile 9! I only run with my dog, a coonhound named Zooey, regardless of the distance. I kind of like the quiet time, although there are some occasions when we pass running groups that I think "that might be fun to do." Quiet time is fun! That's awesome you take your dog out for all mileage. So far Pepper has gotten up to 8 miles. I don't want to push it too much with her. Sounds like a great day:) nice job getting your 15 miles in. I've been doing part of my long runs with a friend lately so I know it'll be a little difficult to go back to being solo again. I've got 8 to do by myself in the morning before I meet up with my run club for another 8. Hooray for the beach! That's my plans for tomorrow! Very good of you to do the 8 prior to the group run and then 8 with the group. That's great planning. I hope you enjoyed the beach! Nice going... love the new header too!